Chief Minister Relief Fund under the management of West Bengal Government will soon issue the Nabanna Scholarship 2019 for all the students for all 12th Passed students, Under Graduate, Passed Students Under Post Graduate Level Students. If you are also one of the eligible applicants then don’t miss this golden opportunity and fill Nabanna Scholarship Application form through the link which is mention at the bottom of the page. The main objective of the Minister Relief Fund (Nabanna) Scholarship supports the weaker students to complete their higher studies. Those who are financially weak get financial aid through this Scholarship Scheme. Applicants whose profile matches this scholarship eligibility they can apply online for Nabanna Scholarship 2018-19 with all essential documents and all attach recent passport size photographs. Xerox Copy of all Previous Years Mark Sheet. Xerox Copy of commendation of MP/MLA to the Honorable Chief Minister expressing month wise. Self Bank Account Details (IFSC Code, Branch Code, Branch Name, Account Number, Bank Name) with Photo duplicate of Bank Pass Book. Tuition/Admission Fee Book Photo State Copy. Complete students Contact Details such as Candidate’s Mobile Number. Students must have a permanent resident of the State of West Bengal. The student must be studying in any institutions of the State after passing out the State Board /Council of Secondary Education or a State-aided University in West Bengal. Then find the Nabanna Scholarship Application Form PDF 2019. Then check the all notification carefully. 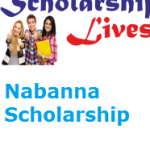 Get Nabanna Scholarship Application Form 2019. Attach necessary documents along with the form. Only applicable for west bengal candidate.